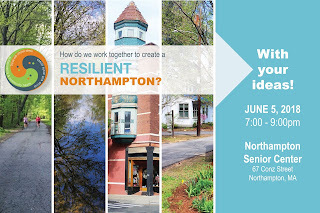 WHERE: Great Room, Northampton Senior Center - 67 Conz Street Northampton, MA. City departments, community partners, and residents have started collaborating on ways to help Northampton thrive by creating happy, healthy, inclusive, and sustainable communities that are prepared for climate change. This public meeting will share progress and kick off the next steps for developing this Resilience and Regeneration Plan. Can’t make this meeting, but want to help? Let us know at the link below!